I finally made it back to one of the National Portrait Gallery’s drawing days. This time rather than have a set piece to draw from there was a musician, Rose Maher, playing songs for Reconciliation Week. 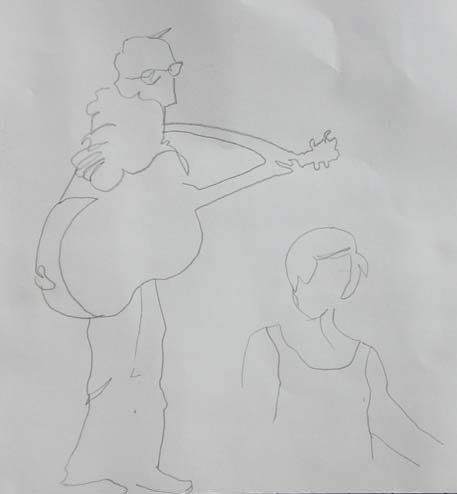 My first drawing was of Rose and her father (whose name I didn’t catch), backing her up on guitar. 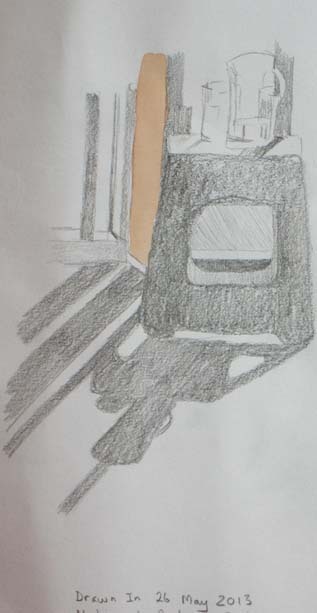 Next I tried the jug and glasses on a small stool, with dramatic shadows provided by the bright sunlight streaming in the window. The watercolour was added later. My final drawing was of some of the other people participating in the event. The watercolour was added later. The next sessions , if you are in Canberra, will be held on Sunday 9 June and Sunday 7 July from 1pm to 3pm. 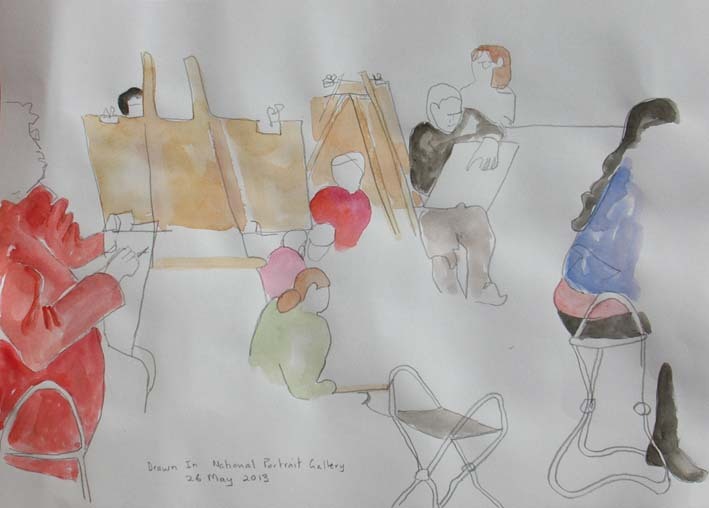 On Sunday 26 June there will be a special life drawing class with Braidwood artist John R Walker (fees apply). 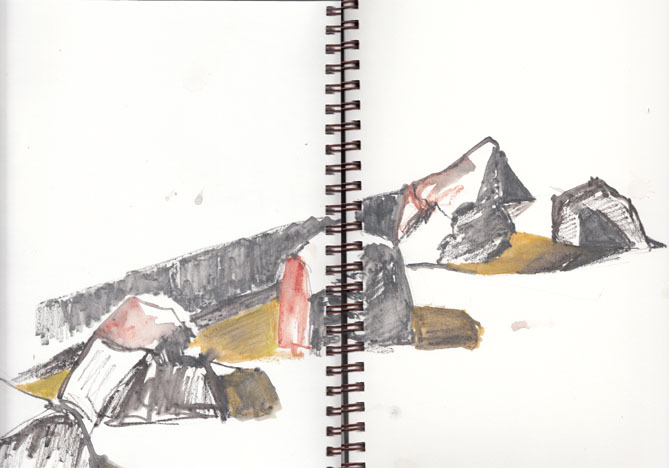 Another speaker at the Designing a Capital forum last week was the artist Geoff Farquar-Still, whose sculpture of a paper aeroplane has come to rest not far from the coffee shop we frequent. 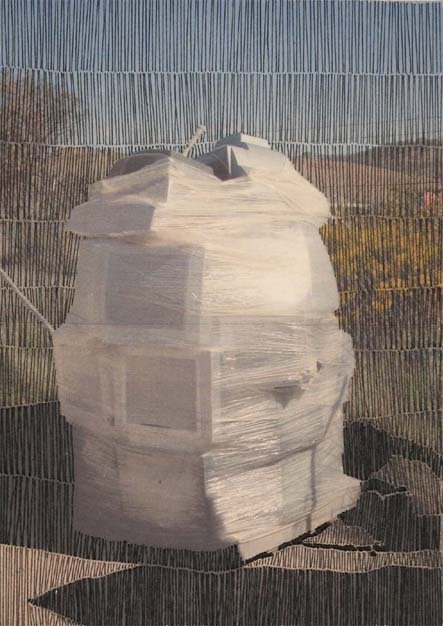 Geoff commented that, when this work was first placed near the High Court building, children played on it, assuming it was a piece of playground equipment. I’m not sure why the piece was moved (I do recall a sculpture competition being temporarily sited in that area), but I’m sure that in its current location, adjacent to a children’s playground, it’s still getting similar attention. 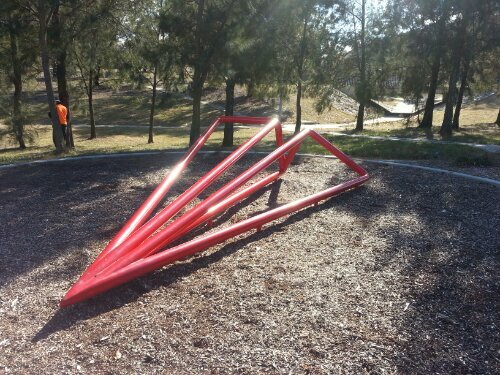 Interestingly, the surveyor working nearby had to be convinced that it was a sculpture and not just another piece of playground equipment. On our weekly excursion to the coffee shop the question is what will I draw today. 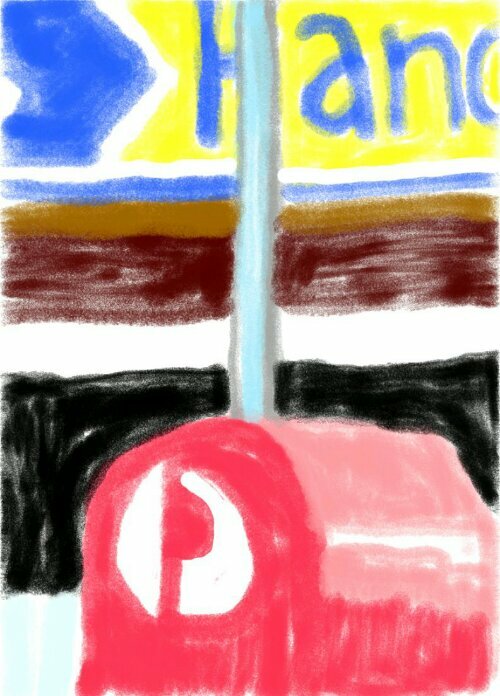 This time it is the letterbox and part of the convenience store facade. Well the exhibition has been taken down but I am pleased to be able to link to the essay written about the show by the curator Peter Haynes. The essay can be found here. Last Friday I attended a day-long forum called Designing a Capital: Crafting a Nation, put on by Craft ACT. Lots of interesting presentations, not the least about the building we were sitting in, the Nishi Building, part of the New Acton complex. Architect Craig Baudin (Fender Katsalidis Architects) spoke about the integration of art into the building design process. As he spoke just before lunch I took the opportunity during the break to check out some particularly interesting works. Sculptor Steven Siegel has made two works for the Nishi building. 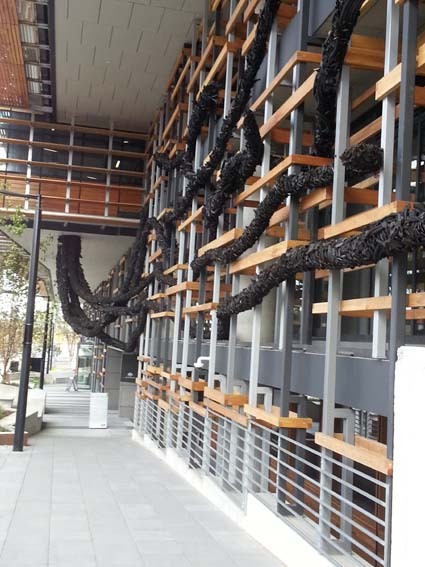 His sculpture Carbon is woven through the eastern facade of the building near the entrance. 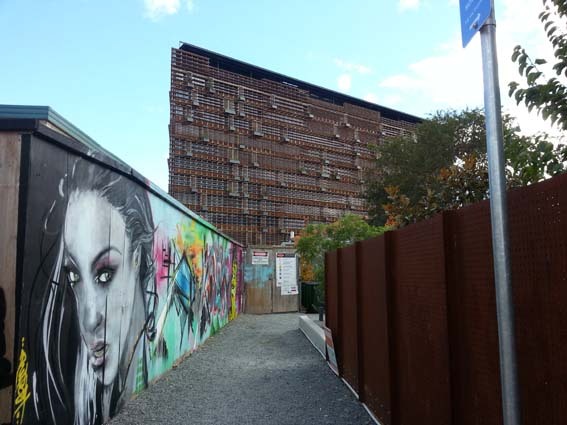 It is made from recycled tyre rubber and looks like a series of roots finding its way out of the bottom of the building. His other work, Paper, is already disappearing into the landscape. 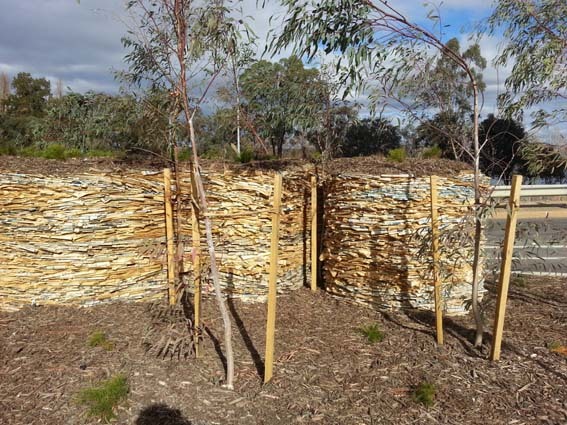 It is composed of two years worth of Canberra Times newspapers, stacked to make a wall at the end of the access road. The development of this work over time will be fascinating to watch, particularly as the plants on top of the wall start growing into the work. You can read more about Steven and his work for Nishi here or check out Steven’s website here. Last but certainly not least is the grand staircase, currently moving majestically towards the yet unfinished Nishi Hotel. 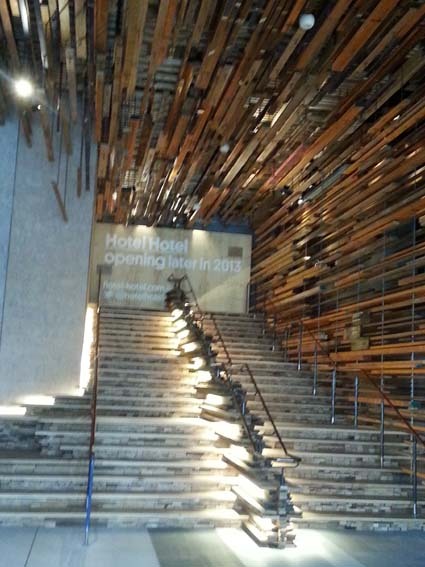 Designed by the March Studio group and composed of offcuts of wood, including some leftovers from the building’s facade this amazing collection of timber is the highlight of the foyer. I’m not sure if it was low blood sugar or plain excitement, but I managed to get only blurry photos of this masterpiece. Some clearer photos can be found here. To divert my nervous energy from the exhibition opening last Friday my partner suggested we get on our bikes and ride to the nearby Lake Tuggeranong to do some drawing. The most difficult thing was to decide what to draw. The lake is wide and the view of the mountains and the town centre on the far side was far too broad a panorama to make a particularly good composition. So I plumped instead for the storm water diversion system at the northern end of the lake. Alright not everyone’s first choice for subject matter but the complex system of drains, catchment basins and structures to slow the flow of water made it quite interesting from an artistic perspective. Not to mention the variety of waterbirds that were using the different depths of water to catch their food. Here is the initial section where the storm water flows into the first collection basin. I was looking towards the sun so there were lots of dramatic contrasts and back-lighting of the vegetation. I did some additional work on the grasses at home. 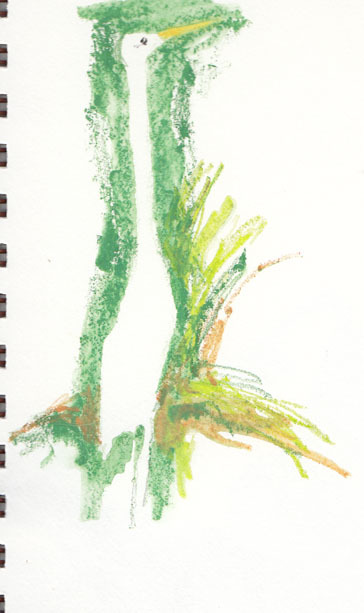 While I was letting the paint dry on my first painting I was able to turn my attention to do some quick sketches of a Great Egret (Ardea alba) which was fishing in the small creek running off the bottom of the system. As the egret’s plumage is pretty much all white it was an easy choice to paint it by using negative space. Here are two views. I’m also pleased to report that while we were watching the egret actually caught a fish! We enjoyed watching it manouvre the fish around before swallowing it. 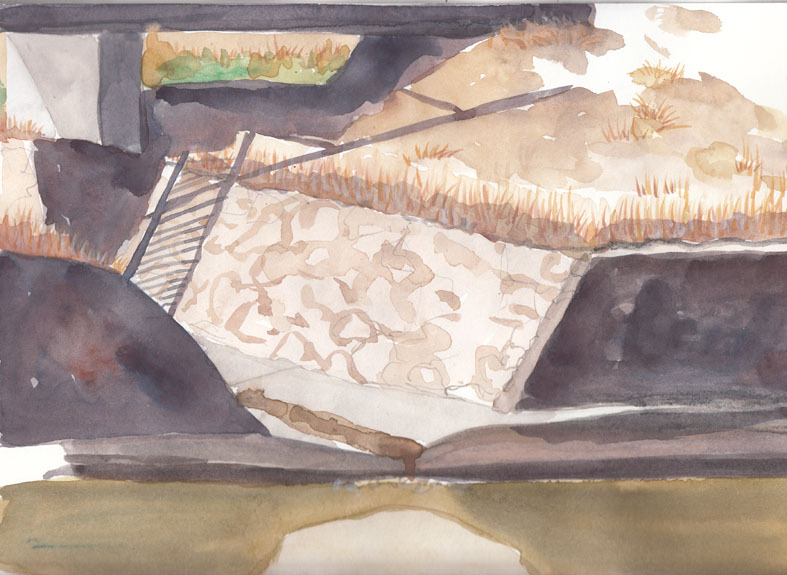 My final sketch, using watercolour pencils, is of the lowest level of the structure where large natural boulders have been placed to break up the flow of fast water in order to limit erosion to the banks of the lake. There are still more sections of this structure to paint so I’m sure I’ll be back. Tomorrow, 10 May, sees the opening of Off the Square an exhibition that I am in along with 8 other artists – Paul Dumetz, Myles Gostelow, Trenna Langdon, Moraig McKenna, Peter Minson, Vicki Passlow, Rozalie Sherwood and Kate Ward – at the Belconnen Arts Centre. I’m really excited because my work, above, has been used to publicise the show, woo hoo! 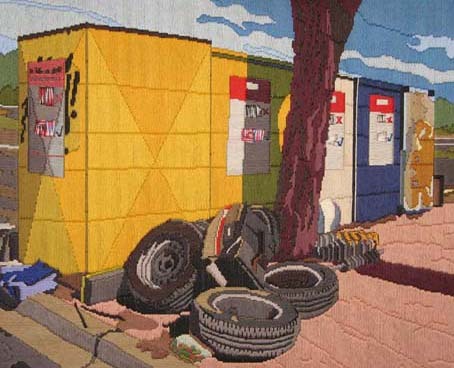 This piece took me a month to stitch, that is after I had developed the design from photographs taken by my partner, just after Christmas of the charity bins at our local shopping centre. All the work for the show was dropped off earlier this week so I’m feeling somewhat aimless after several months of hard work. 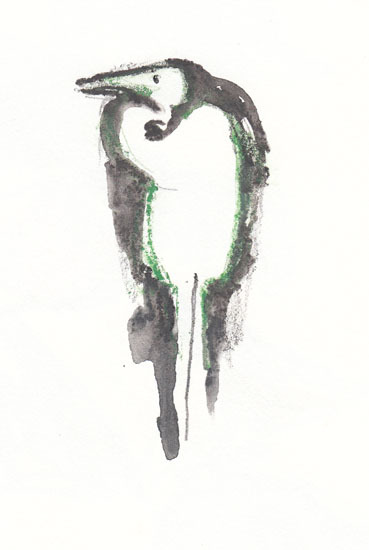 Now I’m starting to develop new designs for some future unspecified show. This time I’m keeping a time sheet to try and keep track of how long each piece takes me.